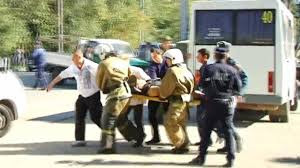 O Lord, we ask for mercy in Kerch, Russia, after the horrific mass shooting that happened at the college there today. The immediate aftermath of these terrible shooting sprees is overwhelming. First, Lord, we pray for those students fighting for their lives in hospitals right now. We pray for the medical care to be excellent, efficient, and enough. Second, we pray about the severe trauma these students, school staff members, and emergency responders have experienced. Please bring them through this immediate shock and emotional agony. Bring the peace that passes understanding. Bring wise counselors, listening ears, and loving support around them. Walk closely with them in the months and years of continued recovery many will require. Next, we pray for law enforcement as they seek to unravel the mystery surrounding this crime. May they discern what compelled young Vladislav Roslyakov to kill and maim as many innocent people as possible before taking his own life. Be with Roslyakov’s family as they process this as well. Finally, we pray that this mass school shooting would be an isolated incident in Russia. We pray against copycats. Help everyone clearly see that this was an evil, terrible act. In Jesus’ merciful name we pray, amen.